↑ Department of the Army (July 1, 2002). "Section 578.4 Medal of Honor". Code of Federal Regulations Title 32, Volume 2. Government Printing Office. Retrieved March 14, 2012. 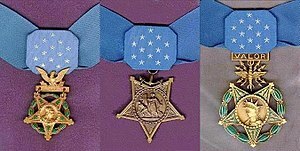 ↑ 3.0 3.1 3.2 "Medal of Honor recipients". Statistics of Soldiers, Sailors, Airmen, Marines, and Coast Guardsmen who received the Medal of Honor. United States Army Center of Military History. August 13, 2013. Retrieved September 5, 2013.